The American Clinical Neurophysiology Society (ACNS) has presented the 2017 Pierre Gloor Award to Charles M. Epstein, MD, professor of neurology at Emory University School of Medicine. Named after the influential physician-researcher of the Montreal Neurological Institute, the award is presented annually for outstanding contributions to central clinical neurophysiology research. 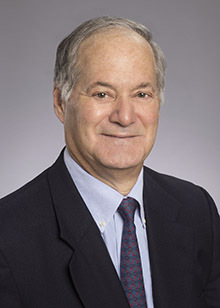 Epstein has been at Emory since 1978 and specializes in epilepsy and seizures. He has also done extensive work in electroencephalography and transcranial magnetic stimulation (TMS), and helped to develop a coil design for TMS that was the first non-invasive treatment for depression approved by the FDA (2008). As recipient of the Pierre Gloor Award, Epstein presented his recent research at the 2017 ACNS annual meeting in Phoenix.